On a recommendation from my friend’s father, I stopped at Mancora beach on my way north to Ecuador. The town has a great small surf town beach feel and a really cool vibe. I stayed at Kokopelli Hostel (http://www.hostelkokopelli.com/mancora/es/where.html), and what a great decision that was. It was the perfect balance between a social hostel and a place where you can actually get some sleep and relax. It’s located across the street from the beach, and less than a five-minute walk into the main part of town. From the moment I walked in the door, the hostel staff was nothing short of sensational. I was very impressed with the service. Every single person who works there is attentive, friendly and seems genuinely happy. They call you by your name and really make you feel at home. The eight bed female dorm is priced at 30 soles a night (approximately $11), and there is a bathroom in the room. Considering it is an eight bed dorm, it’s actually quite spacious, with enough room for your backpack and huge lockers under the bed. The beds are big and comfortable. The hostel has a great bohemian vibe, with surfboards lying around, a ping-pong table, hammocks for relaxing and an outdoor bar next to the pool. Sounds of Bob Marley fill the air and you realize you’ve reached paradise. Breakfast is UNREAL (and included in the room fee)! This is the first place where I actually got fresh eggs instead of just bread and jam. You also get a fresh squeezed passion fruit and pineapple juice with breakfast, along with coffee! I was incredibly pleased with the quality of the food. The hostel is quick to offer you recommendations for surf schools and other activities around town. They also offer great quality food for a very reasonable price. I ordered the ceviche as a starter and grilled chicken as a main – for only 12 soles! Everything is well maintained and clean. I saw people cleaning the common areas all day. The only issue there was the wifi. It was spotty, at best. But it wasn’t the hostel’s fault – Movistar, the network provider, has restrictions on the number of users. You will eventually connect, but it could take a while. All in all, my experience at Kokopelli’sMancora beach was wonderful.On your way up the Peruvian coast, this place is a must see. I highly recommend the hostel to anyone visiting the beautiful beaches of Mancora. I came to Lima and stayed at the centrally located Pariwana Hostel in Miraflores, unknowing that I could get a free bed for writing three short articles on some of my experiences in Peru. Once I found out, I got to work. These three short articles may be helpful for those traveling to Peru. Happy reading. As most backpackers, I decided to do the border crossing into Peru at Lake Titicaca, more specifically, at Copacabana after a visit to La Isla del Sol. While some people decide to take a stop in Puno, I decided to go straight to Cusco – a decision I would later regret. Upon arriving in Copacabana, there is a street, perpendicular to the square, with loads of restaurants, travel companies and Internet cafes. Most of the travel companies will offer you tickets to Puno or Cusco, or to both, with a stopover in Puno. The cost was 80 Bolivianos (or approximately $12 USD) to go all the way to Cusco. Be advised: while the first bus they offer to Puno (and for the border crossing) is quite nice and comfortable, the second bus to Cusco (which is significantly longer) is barely better than a local bus. You will first get on the bus to Puno. I left at around 1:30 pm. You arrive at the border before you know it (less than an hour), and must have your passports, and your immigration form, ready to exit the country. The buses will drop you off, and wait for you on the Peruvian side. The whole process takes less than thirty minutes. You will walk across to Peru (marked by the logo on most Peruvian shirts), and the immigration on the Peruvian side is efficient and quick. To my pleasant surprise, no reciprocity fees or visas were necessary for American citizens (a first during my travels). You will be haggled by people trying to get your to convert money. We were advised by our bus driver to change currency at the ‘Small Bank”, which also doubles as a convenience store. From the border, it took about 3 hours to Puno (don’t forget to set your clocks back an hour after you cross the border). I was quickly ushered to my “Cusco” bus. This bus was far less comfortable and much more local. The 7-8 hours on this bus are quite uncomfortable, and you arrive in Cusco close to midnight. It’s a long day, folks. So if possible, I recommend staying in Puno for a day or two and enjoying the reed communities on the lake. The ride to Cusco will seem much shorter and you will be more prepared for that uncomfortable bus ride to Cusco. I had the pleasure of taking a little adventure to the beautiful oasis of Ica, called Huacachina. It’s on the way to Lima, from Cusco. I took a lovely Cruz del Sur bus, which absolutely blew my mind. I had gotten used to the comfy buses of Argentina, and was sorely disappointed at the quality of buses as I headed through Bolivia. But not this one: the bus from Cruz del Sur, for a bargain price of 165 sols (approximately $25 USD), you get the following: dinner and breakfast, personal TV’s, 160 degree reclinable chairs and wifi! The 16 hour ride was comfortable and luxurious. Once you arrive in Ica, you can take a 7 sols taxi into Huacachina. I stayed at Banana Adventures hostel and was so glad I did. Immediately greeted by a bunch of poolside backpackers, you know you’ve reached some sort of paradise. The entire town is built around the lagoon and Banana Adventures is where most backpackers will go to swim, drink and eat. While the food is a bit pricey (15-20 sols for a meal), you’ll find similar prices in most of Huacachina, given that it is a complete tourist town. The 4-bed dorm room for two nights cost me 95 sols, which included the two hour dune buggy and sand boarding tour (which is normally 35 sols), so the room ended up being 30 sols per night. A good price, with the exception that the bathrooms were shared and pretty far away (by the pool). If possible, try and get a room with a bathroom. The first night, I climbed up the dunes and watched the sun set. An excellent idea. The next day, it was a pool day, followed by the dune buggy tour. 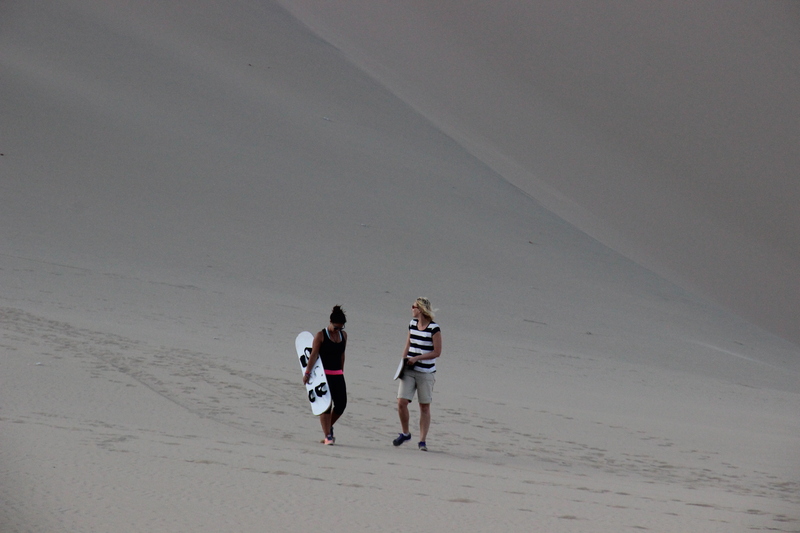 It starts at 4:30 pm and you ride the sand dunes like a roller coaster, not knowing when the next drop will come. You later break out the sand boards and experiment with all different forms of going down the giant dunes: face first, legs first…and if you are really brave, you stand up. It’s exhilarating and the definition of the traveler adrenaline. friendly (and if you’re rich). It costs between $90 – 150 USD. An activity meant for the wealthier of us fellow backpackers. I hear it may be worth the expense if you are an avid flier, however many reviews from fellow backpackers implied that you couldn’t see them too clearly from the sky. Huacachina is a must-see in Peru. Even if just for the sand dunes – how often can you see an oasis in the middle of the desert? On your way from Ica to Lima, you can find the beautiful “poor man’s Galapagos” islands, called the Isla Ballestas. Only an hour from Ica, this trip can run you between 30-50 sols. I paid 50 sols, including the boat ride to the islands. There is a hidden charge of 12 sols, which is a required tourist tax. Once you arrive in Paracas, you hop on a boat, see the most gigantic jelly fish you’ve ever seen in your life, and get ready to see all the incredible wildlife on these islands. You’ll likely first see the “Candelabra” figure in the sand, and then move on to see thousands of pelicans on the island. The real adventure comes when you see the sea lions on the shore. Hundreds upon hundreds, all basking in the sun. Then the best part comes: the penguins. They are wiggling their way down to jump into the cool water. The best part is when the boat goes to the ‘maternity ward’ of the sea lions. You can hear the babies’ sounds and all the sea lions. Although the tour is only two hours, it’s plenty of time to see all the incredible wildlife. Once you are back to shore, there of plenty of places to stay in Paracas. I chose Icthus hostel – a family owned place with an atmosphere rivaling that of Santorini. The rooms are clean, spacious and comfortable. Breakfast is quite nice (jam, bread, fresh fruit and yogurt) for 6 sols. However, other than the boardwalk, the choices of activities are somewhat limited. I chose a paddle boat for an hour for the price of 20 sols off the coast, but other watersports activities are limited. One day and evening is enough for Paracas. You don’t need to stay there, but if you are going to see the islands, it might be a nice getaway before heading to Lima. I recently visited Cordoba, Argentina on my way north to Salta and Bolivia. The second largest city in Argentina, and home to its oldest University, Cordoba is a vibrant city alive with unmistakable energy thanks to the key demographic of college students. I stayed at Tango Hostel (http://tangohostelcordoba.com/en/) in the heart of the college district. Centrally located, you can walk to the main parts of the city center in ten minutes. You also have the two imperative traveler requirements nearby: laundry facilities on the corner and a grocery store less than two blocks away. Upon check-in, Vicky, one of the owners, immediately greeted me. Vicky has that wonderful air of positive energy, a giant smile and goes above and beyond to make sure your stay is comfortable. The place itself is like a little home. When you’re on the road for so long, it’s nice to feel like you are in your own place: to sit in a living room area with a TV, and just kick up your feet as if you were in your own house. And that’s exactly what you get at Tango – the feeling of being home. Since it’s a small hostel, you get called by your name and treated like family. Leandro, or “Lele” has the morning shift and he makes sure you get your breakfast the minute you go downstairs (it’s included). Breakfast consists of bread, jam, butter, dulce de leche, tea or coffee. While I was there, they had a choripan night, but unfortunately I had to make my bus before it was ready. Everyone in the hostel was getting in on the choripan action, so I’m sure it turned out great. In terms of activities, the hostel offers a walking tour of the city for 80 pesos, led by their very own Lele. I took the tour and was really impressed; Lele’s passion for the city really shines through and that’s what makes the tour so great. They offer other excursions like trekking, skydiving and horseback riding; you only need to ask. The hostel creates a ‘family’ environment in the kitchen area, so most travelers end up chatting it up, having some drinks, and eventually going out together. It’s not the crazy social hostel where you sleep all day and go out all night; it has a good balance of promoting that nightlife activity, the social aspect and still managing to get you out to explore the city and surrounding areas. Cleanliness is top notch. I would see Vicky and Lele cleaning the rooms and bathrooms every morning. The lobby has this addictive clean cotton smell that I just couldn’t get enough of. So for the bargain price of 100 pesos a night (for a 4 bedroom dorm and shared bathroom), this place gets a gold star on the Mayra scale.